I love my little kitchen garden. Admittedly very small at only about 400 square feet, my garden produces a vast array of produce year round—tomatoes, figs, cucumbers, squash, beans, micro greens, and lettuce during the summer months and kale, cabbages, broccoli, garlic and shallots through the winter and into the spring. 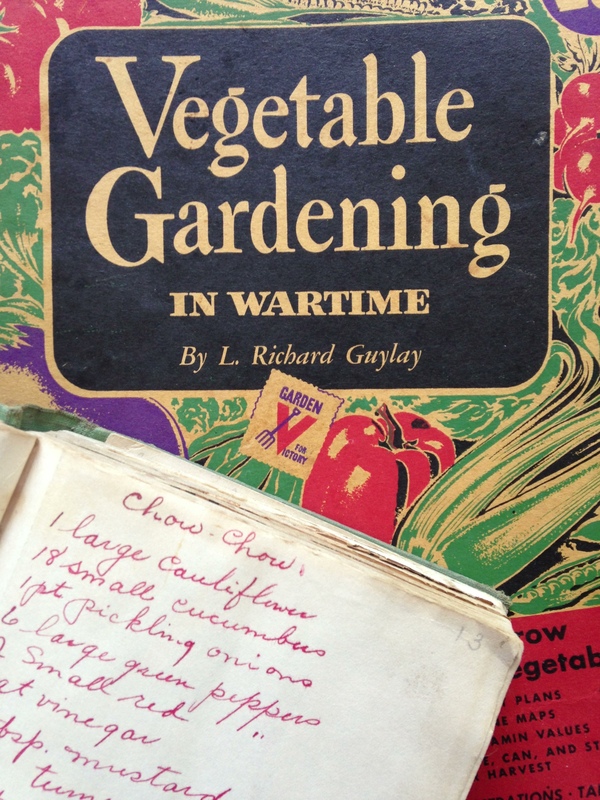 Last June, I purchased a vintage book called Vegetable Gardening in Wartime. Published at the height of World War II and meant to be a reference for newbie patriotic gardeners who wanted to transform their yards into productive kitchen gardens, the book features an array of charts and illustrations designed to educate the reader on how to extend the season, maximize the harvest, and plant in succession. I studied these charts and although I didn’t follow them to a T, they inspired me to rethink how I garden and use my precious kitchen garden real estate each summer. One of my gardening goals this year was to utilize the space throughout the bright and sunny months of summer. This involved planting a little earlier, harvesting conscientiously each day, and pulling the plants once they were spent in order to vacate the space and get going on another fruit or vegetable. Found at an estate sale, this vintage book is a treasure trove of information and advice for those who want to maximize their kitchen garden yields. My best example of this ruthless approach occurred with my Costata Romanesco zucchini and Potimarron Squash. I planted the Italian heirloom zucchini in early May and by late June/early July the plants were five feet tall and producing far more zucchini than I ever imagined could come from a few plants. At that time, I also purchased a packet of Potimarron Squash seeds at PCC. 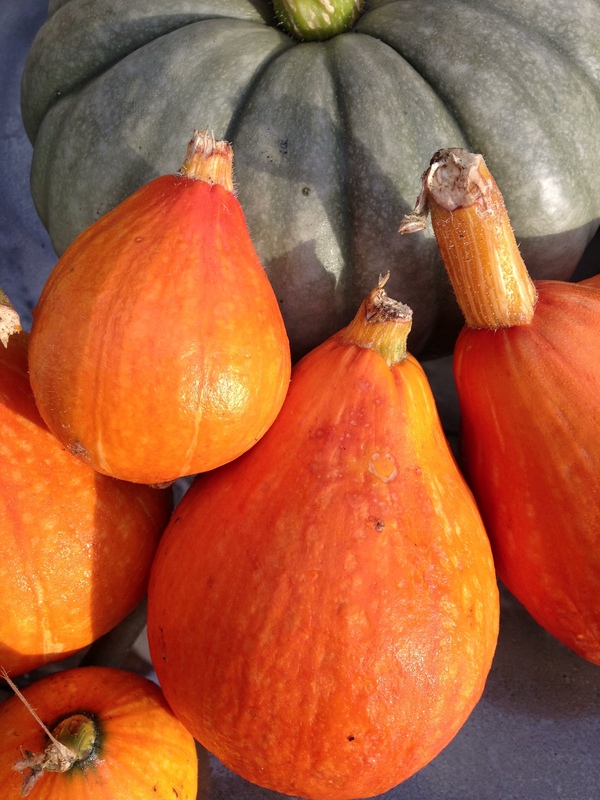 Produced by Uprising Seeds, the packets were on sale and the description of the winter squash was alluring—a small French heirloom that tasted like a cross between a pumpkin and a chestnut. I also liked the fact that the squash were small and grew on compact vines. I decided to push the envelope so to speak and plant a few seeds. Admittedly, I was doubtful that my French heirlooms would REALLY produce. After all, they were getting a very late start and I wasn’t sure they could possibly grow to maturity before fall set in. Well, much to my delight, my Potimarron squash did great in the sunny corner of the yard where I had grown those Italian zucchini. The vines grew vigorously, the squash fruit set and last week we pulled the vines. Although the squash weren’t the exact telltale red, they continue to turn that gorgeous deep red color as they sit outside on my little sunny deck. I probably only got about six or seven squash of varying sizes but from a culinary perspective, I’m thrilled to discover that these little French heirlooms don’t need to be peeled because the skin doesn’t get that tough. (A true time saver in the kitchen and a score for thrifty cooks!) I’m also tickled that the squash store well, which means I can keep them handy for the colder rainy days ahead. And, because they are relatively small in size compared to some other monster winter squashes on the market, the Potimarron are great for individual serving sizes and small families. So, if you want to savor a little victory in the garden, seriously consider planting in succession throughout the season and be brave, exploring new varieties of fruits and vegetables. Previous Jumbleberry Jam Bars-A Simple and Thrifty Baked Good! Next A Seasonal Tool for Apples!